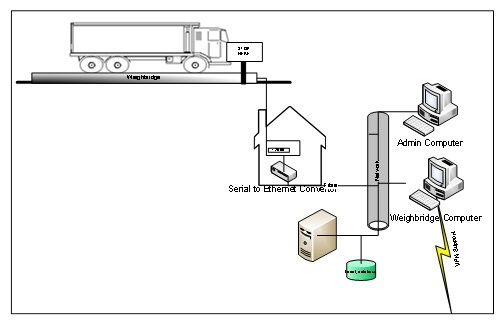 We have provided a weighbridge management system to replace an old Weighman system that was in operation. The solution was based upon a farm management template of ours which includes a dialogue for commodity that comes in or leaves the site. The dialogues are easy to operate and are managed from a remote office. To the left is a diagram of how the system will be configured. A vehicle will drive onto the site. The driver will proceed over to the weighbridge cabin which is located adjacent to the weighbridge and uses the intercom provided to contact the main office. Upon returning to the weighbridge the driver again contacts the operator who can then either re-enter or select the vehicle from the vehicle on site list. The operator will validate that all of the data is correct before weighing the vehicle out and producing a ticket. Note: Stored tare weights can be used so that an immediate final weight can be produced using a stored tare. The ticket layout is the image to the right. 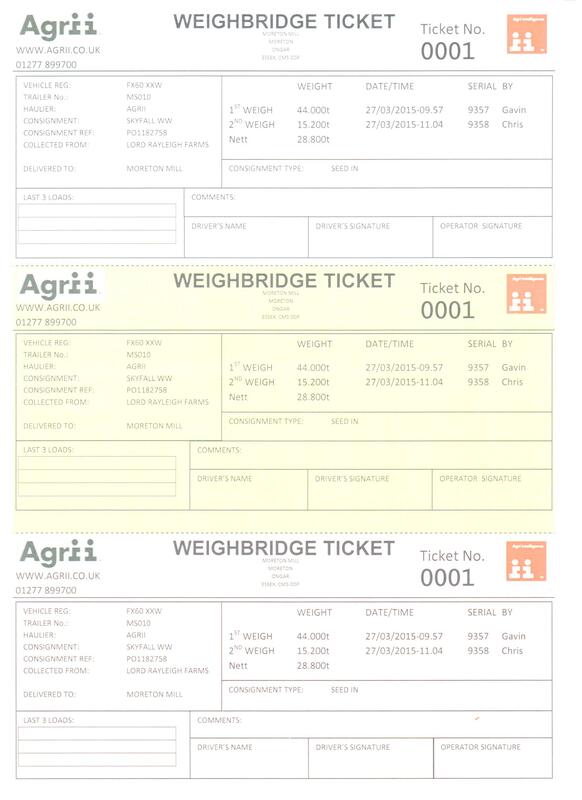 This is printed from a laser printer and it will print out local to the weighbridge operator. This is on an A4 sheet of paper with 3 sections in different colours that is perforated. The driver will then come to the office to collect their part of the final ticket and then leave the site. The system also manages public weighing transactions.